"HazMat" redirects here. For other uses, see Hazmat (disambiguation). An emergency medical technician team training as rescue (grey suits) and decontamination (green suits) respondents to hazardous material and toxic contamination situations. 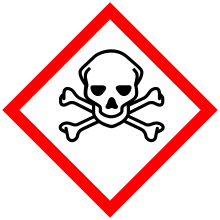 The pictogram for poisonous substances of the Globally Harmonized System of Classification and Labelling of Chemicals. Mitigating the risks associated with hazardous materials may require the application of safety precautions during their transport, use, storage and disposal. Most countries regulate hazardous materials by law, and they are subject to several international treaties as well. Even so, different countries may use different class diamonds for the same product. For example, in Australia, anhydrous ammonia UN 1005 is classified as 2.3 (toxic gas) with sub risk 8 (corrosive), whereas in the U.S. it is only classified as 2.2 (non-flammable gas). The most widely applied regulatory scheme is that for the transportation of dangerous goods. The United Nations Economic and Social Council issues the UN Recommendations on the Transport of Dangerous Goods, which form the basis for most regional, national, and international regulatory schemes. For instance, the International Civil Aviation Organization has developed dangerous goods regulations for air transport of hazardous materials that are based upon the UN model but modified to accommodate unique aspects of air transport. Individual airline and governmental requirements are incorporated with this by the International Air Transport Association to produce the widely used IATA Dangerous Goods Regulations (DGR). Similarly, the International Maritime Organization (IMO) has developed the International Maritime Dangerous Goods Code ("IMDG Code", part of the International Convention for the Safety of Life at Sea) for transportation of dangerous goods by sea. IMO member countries have also developed the HNS Convention to provide compensation in case of dangerous goods spills in the sea. The Intergovernmental Organisation for International Carriage by Rail has developed the regulations concerning the International Carriage of Dangerous Goods by Rail ("RID", part of the Convention concerning International Carriage by Rail). Many individual nations have also structured their dangerous goods transportation regulations to harmonize with the UN model in organization as well as in specific requirements. The Globally Harmonized System of Classification and Labelling of Chemicals (GHS) is an internationally agreed upon system set to replace the various classification and labeling standards used in different countries. The GHS uses consistent criteria for classification and labeling on a global level. Dangerous goods are divided into nine classes (in addition to several subcategories) on the basis of the specific chemical characteristics producing the risk. Note: The graphics and text in this article representing the dangerous goods safety marks are derived from the United Nations-based system of identifying dangerous goods. Not all countries use precisely the same graphics (label, placard or text information) in their national regulations. Some use graphic symbols, but without English wording or with similar wording in their national language. Refer to the dangerous goods transportation regulations of the country of interest. For example, see the TDG Bulletin: Dangerous Goods Safety Marks based on the Canadian Transportation of Dangerous Goods Regulations. For example, the Canadian Transportation of Dangerous Goods Regulations provides a description of compatibility groups. 2.1 Flammable Gas: Gases which ignite on contact with an ignition source, such as acetylene, hydrogen, and propane. 2.2 Non-Flammable Gases: Gases which are neither flammable nor poisonous. Includes the cryogenic gases/liquids (temperatures of below -100 °C) used for cryopreservation and rocket fuels, such as nitrogen, neon, and carbon dioxide. 4.3 Dangerous when Wet: Solid substances that emit a flammable gas when wet or react violently with water (sodium, calcium, potassium, calcium carbide). 5.1 Oxidizing agents other than organic peroxides (calcium hypochlorite, ammonium nitrate, hydrogen peroxide, potassium permanganate). 6.1b (Now PGIII) Toxic substances which are harmful to human health (N.B this symbol is no longer authorized by the United Nations) (pesticides, methylene chloride). 6.2 Biohazardous substances; the World Health Organization (WHO) divides this class into two categories: Category A: Infectious; and Category B: Samples (virus cultures, pathology specimens, used intravenous needles). Radioactive substances comprise substances or a combination of substances which emit ionizing radiation (uranium, plutonium). Hazardous substances that do not fall into the other categories (asbestos, air-bag inflators, self inflating life rafts, dry ice). The Australian Dangerous Goods Code, seventh edition (2008) complies with international standards of importation and exportation of dangerous goods in line with the UN Recommendations on the Transport of Dangerous Goods. Australia uses the standard international UN numbers with a few slightly different signs on the back, front and sides of vehicles carrying hazardous substances. The country uses the same "Hazchem" code system as the UK to provide advisory information to emergency services personnel in the event of an emergency. New Zealand's Land Transport Rule: Dangerous Goods 2005 and the Dangerous Goods Amendment 2010 describe the rules applied to the transportation of hazardous and dangerous goods in New Zealand. The system closely follows the United Nations Recommendations on the Transport of Dangerous Goods and uses placards with Hazchem codes and UN numbers on packaging and the transporting vehicle's exterior to convey information to emergency services personnel. Drivers that carry dangerous goods commercially, or carry quantities in excess of the rule's guidelines must obtain a D (dangerous goods) endorsement on their driver's licence. Drivers carrying quantities of goods under the rule's guidelines and for recreational or domestic purposes do not need any special endorsements. Transportation of dangerous goods (hazardous materials) in Canada by road is normally a provincial jurisdiction. The federal government has jurisdiction over air, most marine, and most rail transport. The federal government acting centrally created the federal transportation of dangerous goods act and regulations, which provinces adopted in whole or in part via provincial transportation of dangerous goods legislation. The result is that all provinces use the federal regulations as their standard within their province; some small variances can exist because of provincial legislation. Creation of the federal regulations was coordinated by Transport Canada. Hazard classifications are based upon the UN model. The European Union has passed numerous directives and regulations to avoid the dissemination and restrict the usage of hazardous substances, important ones being the Restriction of Hazardous Substances Directive and the REACH regulation. There are also long-standing European treaties such as ADR, ADN and RID that regulate the transportation of hazardous materials by road, rail, river and inland waterways, following the guide of the UN model regulations. The United Kingdom (and also Australia, Malaysia, and New Zealand) use the Hazchem warning plate system which carries information on how an emergency service should deal with an incident. The Dangerous Goods Emergency Action Code List (EAC) lists dangerous goods; it is reviewed every two years and is an essential compliance document for all emergency services, local government and for those who may control the planning for, and prevention of, emergencies involving dangerous goods. The latest 2015 version is available from the National Chemical Emergency Centre (NCEC) website. Due to the increase in the threat of terrorism in the early 21st century after the September 11, 2001 attacks, funding for greater hazmat-handling capabilities was increased throughout the United States, recognizing that flammable, poisonous, explosive, or radioactive substances in particular could be used for terrorist attacks. The Pipeline and Hazardous Materials Safety Administration regulates hazmat transportation within the territory of the US by Title 49 of the Code of Federal Regulations. The U.S. Occupational Safety and Health Administration (OSHA) regulates the handling of hazardous materials in the workplace as well as response to hazardous-materials-related incidents, most notably through Hazardous Waste Operations and Emergency Response (HAZWOPER). regulations found at 29 CFR 1910.120. In 1984 the agencies OSHA, EPA, USCG, and NIOSH jointly published the first Hazardous Waste Operations and Emergency Response Guidance Manual which is available for download. The Environmental Protection Agency (EPA) regulates hazardous materials as they may impact the community and environment, including specific regulations for environmental cleanup and for handling and disposal of waste hazardous materials. For instance, transportation of hazardous materials is regulated by the Hazardous Materials Transportation Act. The Resource Conservation and Recovery Act was also passed to further protect human and environmental health. The Consumer Product Safety Commission regulates hazardous materials that may be used in products sold for household and other consumer uses. Trailers of goods in transport are usually marked with a four digit UN number. This number, along with standardized logs of hazmat information, can be referenced by first responders (firefighters, police officers, and ambulance personnel) who can find information about the material in the Emergency Response Guidebook. ^ "Dangerous Goods Regulations (DGR)". IATA. Archived from the original on 2014-04-23. ^ "TDG Bulletin: Dangerous Goods Safety Marks" (PDF). TDG Bulletin: Dangerous Goods Safety Marks. Transport Canada. January 2015. Archived (PDF) from the original on 14 October 2015. Retrieved 5 November 2015. ^ "Rev. 12 (2001) - Transport - UNECE". www.unece.org. Archived from the original on 2015-04-18. ^ "Transporting Hazardous or Dangerous Goods in a Truck or Car". Archived from the original on 2016-02-01. ^ Safety, Government of Canada, Transport Canada, Safety and Security, Motor Vehicle. "Information Links". www.tc.gc.ca. Archived from the original on 2015-04-17. ^ "The Dangerous Goods Emergency Action Code List 2017". the-ncec.com. Archived from the original on 2015-04-17. ^ a b "Hazardous waste operations and emergency response (HAZWOPER)". Occupational Safety and Health Administration (OSHA). 2006. Archived from the original on 10 February 2010. Retrieved 17 February 2010. ^ Taylor, Penny. "Transporting and Disposing of Dangerous Goods in the US: What You Need to Know". ACT Environmental Services. Archived from the original on 19 January 2016. Retrieved 28 December 2015. ^ Werman, Howard A.; Karren, K; Mistovich, Joseph (2014). "Protecting Yourself from Accidental and Work-Related Injury: Hazardous Materials". In Werman A. Howard; Mistovich J; Karren K. Prehospital Emergency Care, 10e. Pearson Education, Inc. p. 31. ^ Levins, Cory. "Dangerous Goods". Archived from the original on 9 May 2016. Retrieved 27 April 2016. ^ "Land Transport Rule - Dangerous Goods". New Zealand Land Transport Agency. Archived from the original on 10 May 2010. Retrieved 21 February 2010. ^ "Guide for Preparing Shipping Papers" (PDF). US Department of Transportation Pipeline and Hazardous Materials Safety Administration. Archived (PDF) from the original on 8 May 2016. Retrieved 27 April 2016.